Please join us at the Ryotei Naha for a traditional Japanese meal and performance. 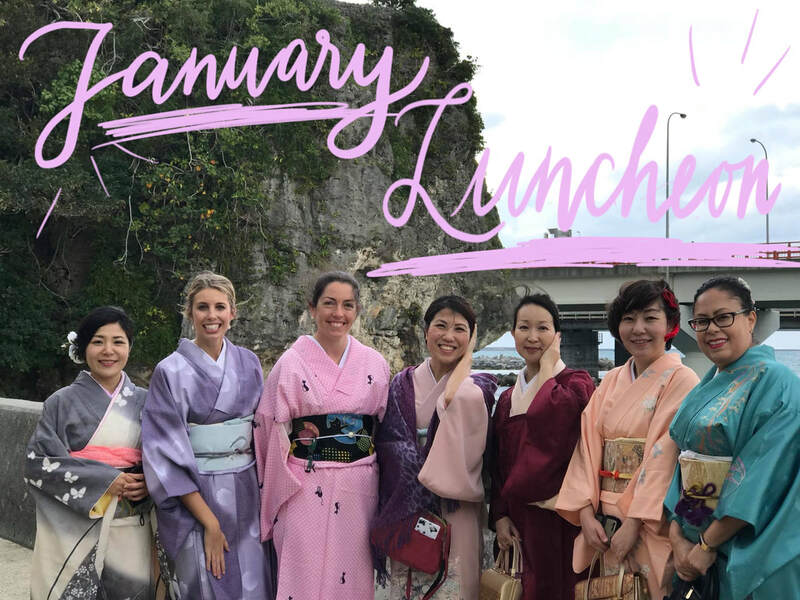 This is the luncheon that all members are invited to wear kimonos, please note that it is not required to wear a kimono to attend. This year kimono dressing will be organized within your culture group. Please check back for more information on the kimono dressing. Please download the below file, print out, fill out and include with your payment for each luncheon. Please join us for our November luncheon! NOTE: FRIDAY, OCTOBER 26th @ 9pm IS THE RSVP DATE DEADLINE! DON'T MISS OUT! This event requires an RSVP **by October 26th at 9 pm** with payment to reserve a seat. Payments can be turned in at a drop box locations. This Facebook event is for publicity only and does not reserve a seat. October Luncheon - Halloween Costume Theme! Come dressed to impress with your best Halloween costume!! There will be a costume contest and other fun activities! NOTE: SUNDAY, OCT 7th at 9 pm is the RSVP DATE! DON'T MISS OUT! This event requires an RSVP **by October 7th at 9 pm** with payment to reserve a seat. Payments can be turned in at a drop box location. This Facebook event is for publicity only and does not reserve a seat. 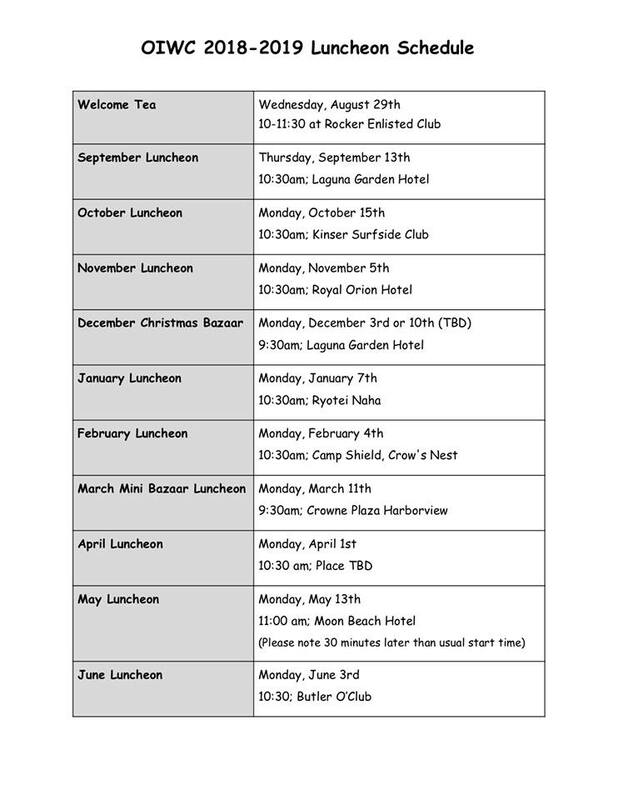 You may attend 2 luncheons prior to becoming a member. To be placed in a culture group, you must be a member. If using a Drop Box, payment is accepted in cash only - no checks - and must be placed in an envelope with your name, contact info and what/who you are paying for. US Dollars for on-base luncheons and Japanese Yen for off-base luncheons. Recommended dress is business, business casual (no jeans), and Sunday best. Only children six months and younger may attend. Please email oiwc4reservations@gmail.com before 9:00 am on the day of the event about your cancellation. If we are able to fill your seat, you will be given a refund. If we are NOT able to fill your seat, we CANNOT refund your money. Cancellations after the 9:00 AM deadline on the day of the event will result in an automatic loss of money. Put cash inside a sealed envelope. Label the outside of the envelope with your name, contact number, what and who you are paying for as well as culture group name. Include exact amount in US dollars for on-base luncheons or Japanese Yen for off-base luncheons; all excess will be donated. Place enveloped into red lock box labeled OIWC at one of the below locations. DO NOT leave envelope if this box is not present. From Gate 1: 2nd Right (at Base Chapel 1), 2nd House on Left. From Gate 3: Drive approximately 5km on Douglas take immediate left after passing Base Chapel 1 into Arnold Terrace. 2nd house on left. From Gate 2: Take Kuter until it ends. Merge left onto Douglas. Drive approximately 2km. Take immediate left after passing Base Chapel 1 into Arnold Terrace. 2nd house on left. 2. Go straight and the house is on the right. ​Please deposit into red locked box labeled OIWC - use a separate envelope for RSVPs and Membership Applications.